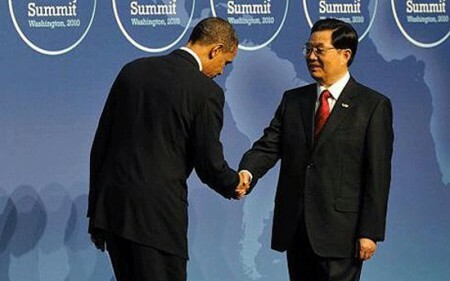 No wonder Obama repeatedly bowed to the Chinese leader. China has dropped 97% of its holdings in US Treasury bills since May 2009. China has dropped 97 percent of its holdings in U.S. Treasury bills, decreasing its ownership of the short-term U.S. government securities from a peak of $210.4 billion in May 2009 to $5.69 billion in March 2011, the most recent month reported by the U.S. Treasury. Treasury bills are securities that mature in one year or less that are sold by the U.S. Treasury Department to fund the nation’s debt. Mainland Chinese holdings of U.S. Treasury bills are reported in column 9 of the Treasury report linked here. Until October, the Chinese were generally making up for their decreasing holdings in Treasury bills by increasing their holdings of longer-term U.S. Treasury securities. Thus, until October, China’s overall holdings of U.S. debt continued to increase. Since October, however, China has also started to divest from longer-term U.S. Treasury securities. Thus, as reported by the Treasury Department, China’s ownership of the U.S. national debt has decreased in each of the last five months on record, including November, December, January, February and March.